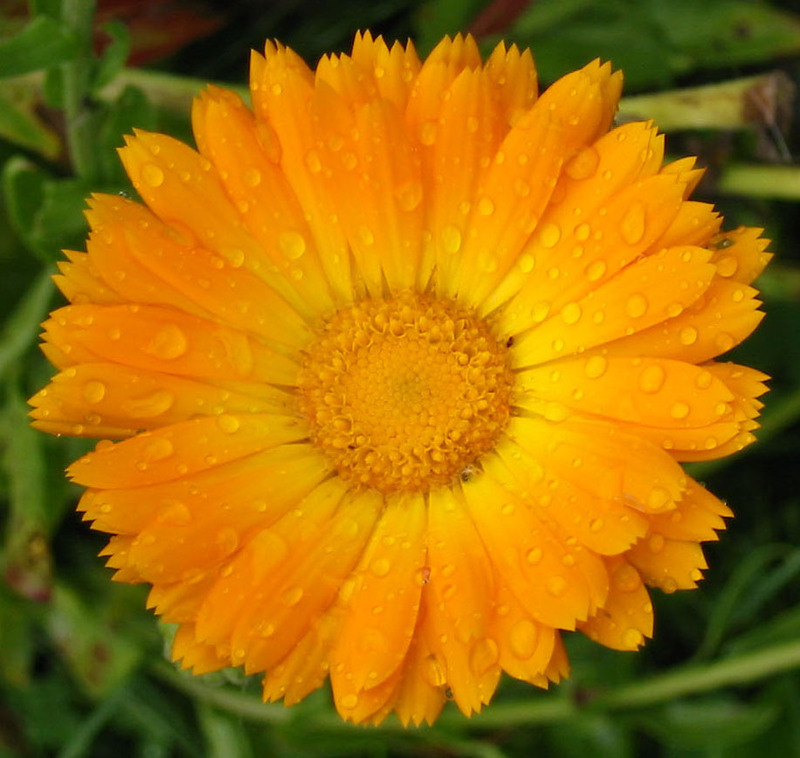 I was inspired by the beautiful Calendula flower. This lotion is a labor of love. First I infuse calendula petals in sweet almond oil for 6 weeks in the sunlight. After straining the oil, which has turned to a beautiful golden orange from the properties of the calendula, I add beeswax, shea butter, evening primrose, vitamin E, Bergamot essential oil and a few secrets. This cream does amazing things to your face when place thick overnight. In the morning you will find your face hydrated and ultra smooth. Right after the morning shower, I pat my face dry, apply a tiny bit on my fingertips and gently massage the lotion into my face not forgetting above the lip and around the neck. You will love the fresh scent from this power packed delicate cream. Beautiful Skin Face Cream in gorgeousclear glass container is available in 2 ounce or 4 ounce containers. Take advantage of our Internet Special - Two 2 ounce jars for just $25! . 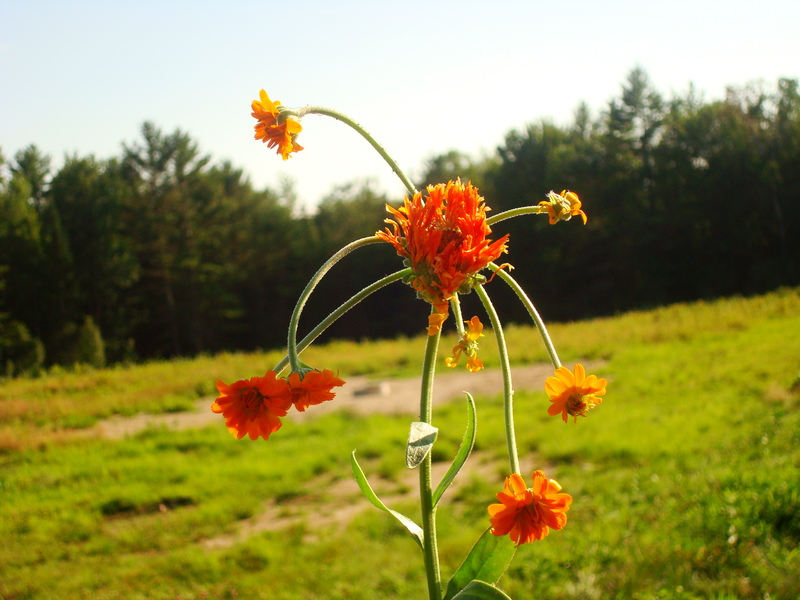 The coolest Calendula I have ever seen. Grown at my friends, Geof and Gina's farm,Hancock Farm. This is the best moisturizer EVER!!! The ingredients are all natural and I think they work hard to keep my skin moist. all natural and all wonderful! I have been using this face cream for about 3 years. I absolutely love it. At my age, 65, can't mess around with gimmicks--this is so clean and nourishing in every season. And no wrinkles for me! I have been using this face cream for years, and my skin glows and looks amazingly youthful! I love the product and the service and the personal touches from Garden Dreams. I found Gardendreams at the Fryburg Fair several years ago and loved the lavender and Fryburg Rose soaps and last year decided to try the face cream. I have sensitive skin and love all natural products, so. I gave this a try. I am so pleased with the outcome. Whether its winter or summer, it's always dry in Montana. This face cream helps balance that dryness, moisturizes like no other, smells great and feels even better! My mom first bought this at an artisan fair (or a farmers' market?) and sent it to me, back in 2011. I was living in Japan at the time, and the winters were harsh to the skin. I *thought* I had a good skin regimen for my sensitive skin, but noticed my skin seemed better with the Beautiful Skin Face Cream. So, being scientifically-minded, I decided to compare the two side by side. WHAT A DIFFERENCE!! The half of my face on which I put the Beautiful Skin Face Cream was DRAMATICALLY better - smoother, softer, better-feeling throughout the day - than that with my former lotion! From that point forward I have NEVER stopped using this. I've shared it with others, recommended it to others, shared it with my husband, put it on my children's chapped faces - it's FANTASTIC!! I get many compliments on my skin and I'm quick to pay that compliment forward and give credit where it's due! This product is the BEST I've ever used. I've been using the best face cream for at least 4 years and I couldn't be without it now! It's like a spa for your face, especially in the winter. It feels so luxurious and melts right into my skin. And the fact that it's all natural is such a bonus after using Lancome products for years! Click the button below to add the Beautiful Skin Face Cream to your wish list.